Avid today announced the release of its first video editing application for the iPad—Avid Studio, available immediately at the Apple App Store. In other words, Avid Studio is taking on iMovie on Apple’s turf. Avid Studio for iPad allows users to begin editing with ease by offering access to any videos, photos and audio already in their iPad library, or media that can be imported from iTunes, cameras and more. Users can then arrange clips in the Storyboard, make precision edits using the Timeline, and enhance their movie creations with high-quality transitions, effects and a soundtrack. They can then share movies directly to YouTube, Facebook and more—or export projects to Avid Studio software, where they can continue editing with even more advanced tools on their PC. In addition, editing enthusiasts can get started fast with an easy-to-understand how-to guide, included with the app. Unfortunately, users report that performance on the iPad 1 is terrible. “With a 64GB wifi Ipad 1 with 40% free it crashes repeatedly and it would not render even the small size of a small test video,” notes an early user. If you’ve given Avid Studio for the iPad a try, let us know what you think! Precision Editing Tools: Avid Studio for iPad is the only app to offer a unique combination of Storyboard and Timeline features, allowing users to arrange clips in the Storyboard, then edit like a pro with the precision of the Timeline, which offers frame-by-frame trimming capability. Avid Studio for iPad also takes full advantage of touch capabilities to offer a fun, easy yet professional level editing experience. For example, with a touch or swipe, users can easily resize and rotate a title directly from the preview window, among other functions. Full Media Access: There are more creative options for editors, with access to all kinds of media—video, audio or photos—in their iPad library as well as access to media from devices via an iPad Camera Connection Kit (sold separately) or from iTunes or other sources. Users can also capture video and photos within the app for use in their projects. The app also automatically recognizes imported media that has been previously organized by albums, events, faces and more—providing fast, easy access. Easy Video and Audio Track Compositing: Users can unleash their creativity by dropping one clip on top of the other in the Storyboard to create a picture-in-picture effect or take advantage of the professionally-designed animated montage themes to layer their photos and videos, all included. Multiple audio tracks also allow for easy layering of music, audio and sound effects to create movie soundtracks. Export to Avid Studio for the PC: Avid Studio for iPad also offers a bridge to the power of the desktop by offering a direct link to Avid Studio software (for PC). Customers who use Avid Studio PC desktop software can continue editing their projects with additional powerful features including sophisticated photo and video correction tools, unlimited timeline tracks, an impressive collection of included content and more. 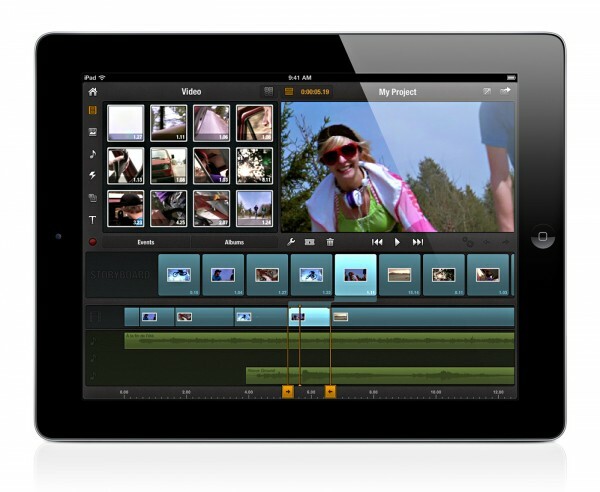 The Avid Studio app for the iPad is available now for a limited-time introductory price of $4.99.